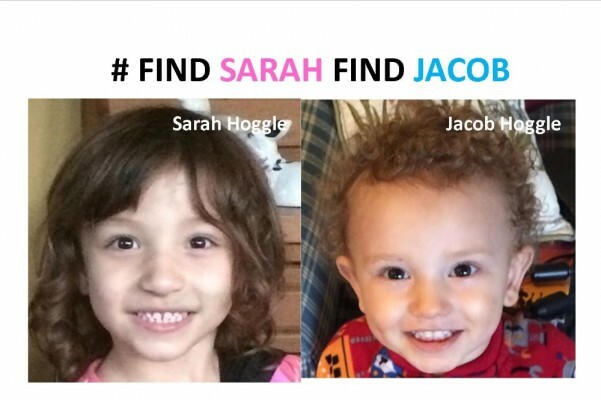 Sarah (age 4) and Jacob (age 2) Hoggle disappeared within 12 hours of each other on September 7-8, 2014 from the Clarksburg, Maryland area. Their mother, Catherine Hoggle, was the last to be with them, and later fled from her common law husband, Troy Turner, when he drove to police. Family and friends had been helping be an adult companion to Catherine and her three children due to her 9 month rehabilitation for treatment of paranoid schizophrenia (including psychiatric hospitalization, transition home and day treatment program). This plan was to assure the children's safety due to the side effects of a heavy medication regimine. Her mother' home in Darnestown, Maryland and Troy/Catherine's apartment in Clarksburg, Maryland served as "home base" for this arrangement. Catherine was found on September 12, 2014 and is being held in a Maryland psychiatric hospital until she is competent to stand trial for their disappearance. Since their disappearance, family, friends and community volunteer have distributed over 50,000 flyers, generated a Facebook page, Twitter , website and searched daily and weekends for Sarah and Jacob. A possible scenario is that Catherine entrusted them with someone who would care for them until she returned. Sarah and Jacob have a 6-year old brother who needs them home. These funds will allow Troy (who returned to work after 2 months) to take additional time off to continue the search, pay for printing of flyers, search supplies, and to support Troy and his family as they utilize any and all resources to bring their family back together. Community support has been overwhelming; we thank you for continued support and prayers. Thank you for all who have contributed and for those who ask how to contribute. We do have another private investigator. I am not sure how to distribute funds but I will find a way.... Thank you. Circling back around to add to the #FindSarahFindJacob fund. We only want Sarah (age 4) and Jacob (age 2) home - Disappeared from Maryland in Sept 2014 - what seems like a plan via their mother to avoid psychiatric treatment. The family continues their investigation into their appearance. We only want them home. UPDATE: For all those who continue to help us search for Sarah (age 4) and Jacob (age 2)- in a variety of ways --thanks is not enough. REMINDER: "No harm, no foul" This is a highly unusual situation and we only want them home. An anonymous tip line is available at www.findsarahfindjacob.com, leave them at a fire station, or other safe haven. All funds raised go to continued investigations and searches. We greatly appreciate all efforts.